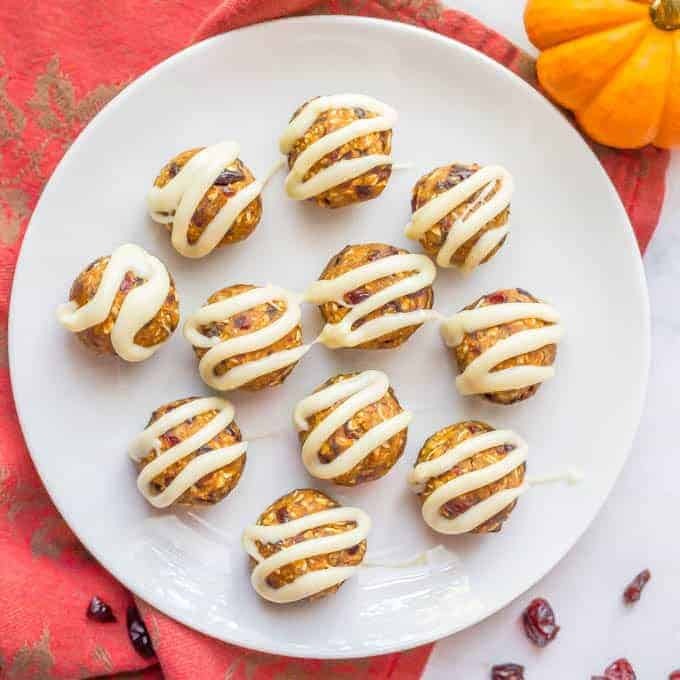 Pumpkin cranberry energy balls are an easy no-bake (and gluten-free) snack full of wholesome ingredients and yummy fall flavors! Ah, Friday, it’s always so lovely to see you! And in honor of Friday, let’s keep this short and move right along to the recipe! Sometime between late October and early November, I start getting on my cranberry kick but I’m not always done with my pumpkin kick. 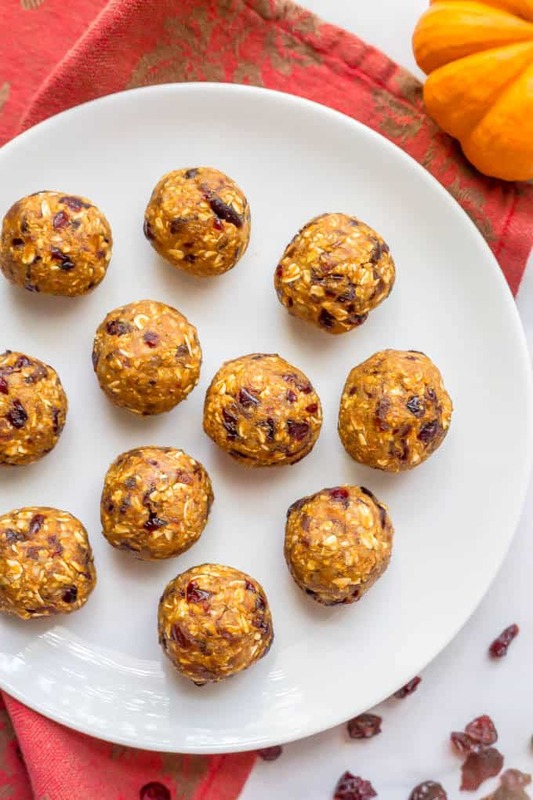 Hence these pumpkin cranberry energy balls. They weren’t balls at all, they were something to be scooped with a spoon (or fingers, if you’re desperate). But the flavor combo was spot on. So I kept at it. And finally, I got the recipe down pat! 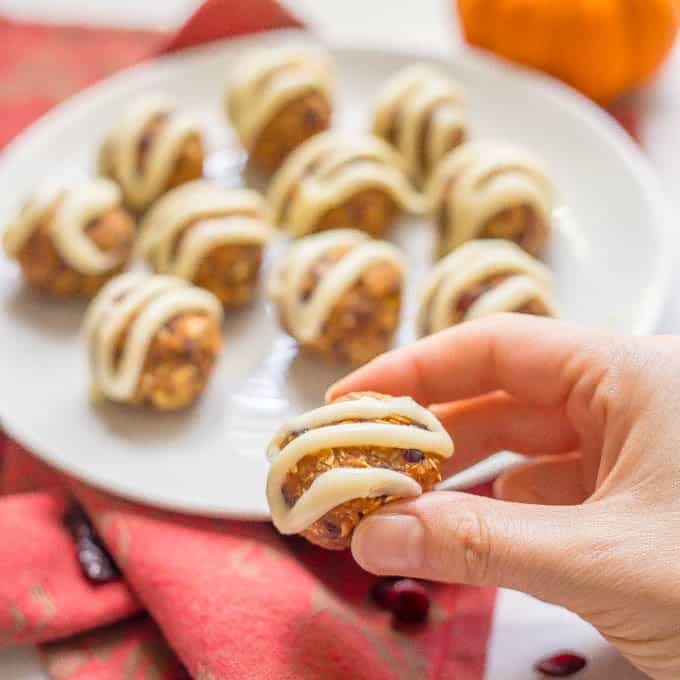 Voila, I present to you some perfect, delectable little pumpkin cranberry energy balls. 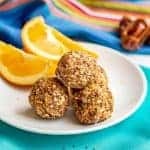 They are delicious for snacking or a pre- or post-workout boost. Even my husband loves these and I usually get to keep these types of snacks for just the kids and I. Sometimes these balls stay together well right away and sometimes they need to set up a bit in the freezer. I think it depends on the moisture level of the dates. I use honey but you could substitute maple syrup if you want these to be vegan. I sometimes drizzle these with melted white chocolate. 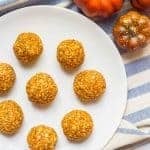 They are plenty sweet enough without it, but it just makes them extra fun and festive, especially for a holiday party. 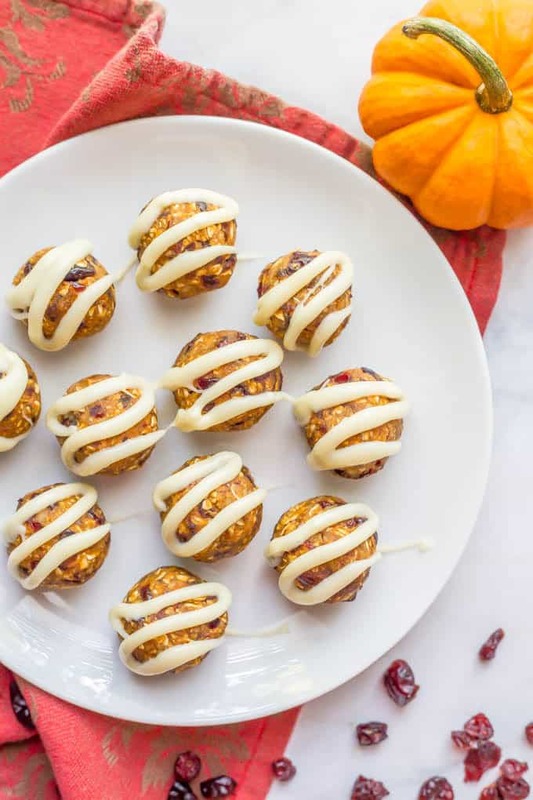 If you crave both pumpkin + cranberry this time of year like I do, you gotta try these pumpkin cranberry energy balls. P.S. 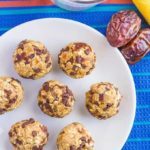 If you love snacks like this, check out my pumpkin protein energy balls, cranberry chocolate walnut energy balls and no-bake chocolate chip cookie balls. 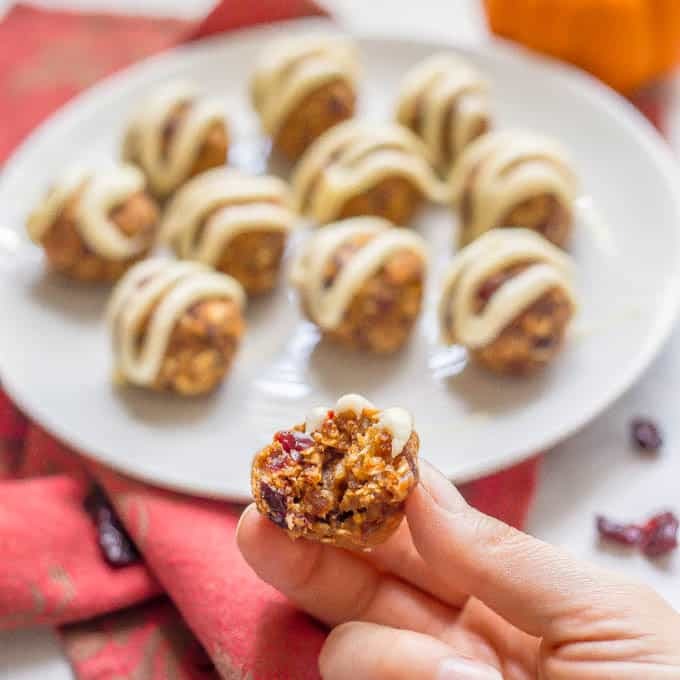 Pumpkin cranberry energy balls are an easy no-bake (and gluten-free) snack full of wholesome ingredients! Add walnuts and oats to a food processor and pulse until broken down. Transfer the walnuts and oats to a bowl and stir in cinnamon. Chop dates into smaller pieces and add to food processor along with the cranberries. Pulse to break them down a bit. Add pumpkin, honey and vanilla to food processor and pulse to mix thoroughly. The mixture will still be a bit chunky and that’s fine. Transfer mixture to the bowl with the walnuts and oats and stir until everything is well combined. Wet your hands with a little water and roll into balls (about the size of a golf ball). 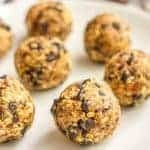 If the mixture is a bit wet, stick the energy balls in the freezer to set up for 15 minutes then store in the fridge. 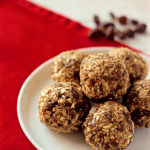 Or if the energy balls are already holding together well, eat right away or transfer to the refrigerator to store. I’ve always wondered why my energy balls set up and sometimes they don’t. It must be the moisture in the dates! Thanks for the scoop! LOVE this recipe. Thanks so much Serena! And yes, I think that’s it – the dates were the only thing that was different from batch to batch for me. Yum! 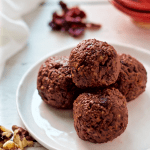 I have some pumpkin energy balls I always make but love this addition of cranberry! And that drizzle! Love the flavors here! 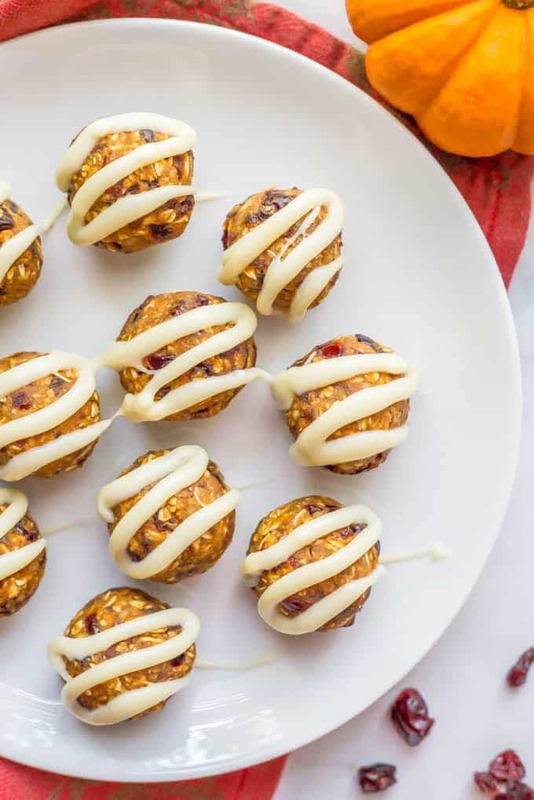 These look like such a nice seasonal treat! Thanks Rebecca! They are a big hit in our house! Hi Juste! Thanks for pointing that out – I’ve updated the recipe card. The pumpkin is added with the honey and vanilla. You could use mashed roasted pumpkin instead of pumpkin puree, but you’ll want to make sure it’s super smooth for this recipe. And you may need to adjust things to get the right consistency. If yours is a bit runny, add more oats and let them set up in the refrigerator. If yours are thick, add a couple of splashes of water. Hope that helps!